It's a deadly game of blackmail. And they're making him play. Kyle McAvoy is one of the outstanding legal students of his generation: he's good looking, has a brilliant mind and a glittering future ahead of him. But he has a secret from his past, a secret that threatens to destroy his fledgling career and, possibly, his entire life. One night that secret catches up with him in the form of some bad men in a dark alley -- they have a deeply compromising video of the incident that haunts him. The men make it clear to Kyle that he no longer owns his own future -- that he must do as they tell him, or the video will be made public knowledge, with all the unpleasant consequences. What price do they demand for Kyle's secret?Strangely, it is for Kyle to do exactly what any ambitious young lawyer would want to do: take a job in New York as an associate at the largest law firm in the world , a job that is incredibly well paid and, with mammoth hours and outrageous billing, could lead to partnership and a fortune. But Kyle won't be working for the company, but against it -- passing on the secrets of the company's biggest trial to date, a dispute between two defense contractors worth billions of dollars to the victor. Now Kyle is caught between the criminal forces manipulating him and the FBI, who would love to unmask the conspiracy. Will his intellect, cunning and bravery be enough to extricate him from an impossible dilemma? 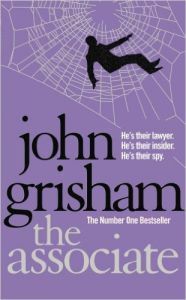 Full of twists and turns and reminiscent of The Firm , The Associate is vintage John Grisham. John Grisham is the author of twenty-two novels, one work of non-fiction, a collection of short stories, and a novel for young readers. He is on the Board of Directors for the Innocence Project in New York and is the Chairman on the Board of Directors for the Mississippi Innocence Project at the Mississippi School of Law. He lives in Virginia and Mississippi. His website is www.johngrisham.co.uk.